Sun Valley Boiler room, always a great time! Powder hounds are up and howling in celebration of the first powder day of the 2006/07 ski season. Up early and prowling the slopes for their favorite deep stashes. It started coming down late last evening and it's not supposed to stop until tomorrow. Forget the 5 a.m. report, it's no longer relevant. EXCLUSIVE COUPON CODE DISCOUNT FOR NOVEMBER 2006 - ENDS in 2 DAYS! : Offer your visitors and site members an exclusive 5% OFF ALL 1 & 2 DAY CARDS!!! The coupon code is 5off1and2day 1 code per customer. COUPON OFFER ENDS on NOVEMBER 30, 2006. Visitors simply enter this code at checkout from any of our products. 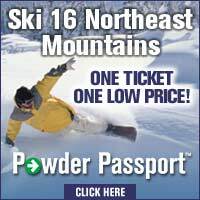 Northeast SKI Product - POWDER PASSPORT! PAGANELLA, Italy (Nov. 28) - U.S. Ski Team athletes will take advantage of a new on-snow training opportunity beginning this winter. The U.S. Ski Team and the tourism office of the Italian province of Trentino have announced a partnership that will provide the team exclusive on-snow training at the northern Italian resort of Paganella near Andalo and Lago di Molveno. The three-year partnership with Trentino S.p.A. is the first of its kind for the Team, providing exclusive on-snow training between European World Cups. It is part of an ongoing effort by the Team’s parent organization, the U.S. Ski and Snowboard Association (USSA), to develop training facilities worldwide for its athletes. The Team also recently announced a partnership with Keystone Resort in Colorado for early-season training. The Keystone partnership was noteworthy for the Team’s unique ability to control its snowmaking for early-season training through Keystone and York Snow. “It’s important for us to build alliances with international organizations like the U.S. Ski Team create awareness and exposure for what the Trentino region has to offer in winter sports,” said the president of Trentino S.p.A., Tito Giovannini. Under the terms of the partnership, U.S. Ski Team athletes will have lodging and training facilities for selected periods during the World Cup season. U.S. alpine coaches will wear advertising marks promoting the Trentino region. Paganella is located immediately off the Italian autostrade south of the Brenner Pass, just an hour south of Innsbruck, Austria and just norththwest of Trento, Italy. It is easily accessible via the international airport in Verona. “It’s important for us to build alliances with international organizations like the U.S. Ski Team to help us better market what the Trentino region has to offer in winter sports,” said Giovanini. “Our region’s winter sports program has grown tremendously in the past few years,” said Eduino Gabrielli, president of the Paganella regional skipass company. “This partnership testifies to the quality of our resorts and will allow us to greatly increase our visibility.” The Team plans to use Paganella’s Olympica (Olympic) run, as well as Nuvola Rossa (Red Cloud). The partnership grew out of several long-term relationships including Italian bicycle manufacturer Francesco Moser’s work with American skiers, as well as USSA’s relationship with Italian businessman Tito Giovanini, the president of Trentino S.p.A. Giovanini, who is presently an executive with Media Partners which manages USSA’s international television rights, is a past employee of the International Ski Federation and was past director of the FIS Nordic World Championships in nearby Val di’Fiemme, Italy. The FIS Alpine World Cup season opens Oct. 28-29 in Soelden, Austria, then moves to Levi, Finland Nov. 11-12 before heading to North America. There are 16 ski resorts in Iran, but the most famous and largest of them is Dizin. The resort has a reputation for excellent snow often like powder, high altitude (one of the world's 40 highest ski centers) and the north facing slopes of Mt Sichal. The resort length is 4 km with 950 meters vertical descents at altitudes of 3600 to 2650 meters from the see level. The ski facilities include 3 gondola lines, 2 chair lifts and 6 T-bar lifts. The main line takes from first station in height of 2650 m to a restaurant in the middle of the mountain at about 3175 m where there are many other lifts including the one that takes to the top just below the summit of Mt sichal. In the upper slopes of Dizin there are magnificent panorama of 4387 m Mt Kholeno, 4210 m Mt Sarakchal, 4156 m Mt Koloun Bastak, 5671 m Mt Damavand in the east and 4850 m Mt Alamkouh in the west. snow disappears in Dizin on summer, but skiing continues, in the recent years grass skiing has become popular and several international competitions have been held in Dizin. On 2nd December the first uphill facilities will open in some ski resorts. Once more this year we have prepared many news items and promotional offers, all of which we will pass on to you .